Remove Stubborn Stains completely and safely. Simply spray the cleaning solution directly on soiled area and gently rub toward the center of the stain with a clean cloth until the stain loosens. Dirt disappears like magic! Removes stubborn stains completely and safely. Restores beauty to stained, soiled and worn leathers. Will not affect the leather's original properties or finish. Restores and vitalizes. 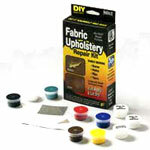 Remarkable color fabric fibers allow repairs to any color fabric upholstery. Matches popular colors/grains. Seven intermediate fabric color fibers, applicator, screen, spatula, mixing cups, filler adhesive, backing fabric , color mixing guide & complete instructions. Kit repairs approx 25 average sized damages. E-Z coloring of stains on fabrics Eliminate stains permanently. Each kit is complete with seven intermixable colors, applicator, spatula, mixing cups, color mixing guide and complete instructions. Kit repairs approx 25 average sized damages. Part # 18072 net weight 1.8 oz. Repairs burns, holes, rips and tears to large & small damaged areas. No-heat process makes near perfect repairs. Complete with color repair compound, grain paper, spatula and complete instructions. 7-standard colors Black, Brown, Blue, Yellow, Red, Green and White. Kit repairs approx 25 average sized damages. Color stains away instantly! 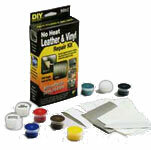 Eliminate stains permanently on leather and vinyl. Matches popular colors and grains. Kit comes complete with 7 intermixable colors (red, blue, green, yellow, white, brown and black), color mixing guide, mixing cups, appliator, and easy-to-follow directions. Repairs chips, burn holes, cracks, scratches, blemishes and imperfections to wood, formica, paneling, plastic or any hard surface. Complete with 7 intermediate colors, applicator, spatula, mixing cups & color mixing guide, sand paper grain pattern, clear finish & complete instructions. Kit Repairs approx.25 average sized damages. Conceals minor scratches, blemishes, worn edges and imperfections. Popular marker colors match Natural, Light Oak, Dark Oak, Cherry, Walnut and Mahogany. Filler Sticks blend with light, medium and dark wood grains.